The number of LP’s being mailed in the post or sent via a courier continues to grow. People of all ages are shipping vinyl records within their own country or overseas every day. The vinyl revival has seen the sales of old records soar, so much so that recently vinyl album sales outperformed digital downloads for the first time. Record collectors and those who sell records online for cash need affordable courier services to then ship those beloved LP’s to customers the world over. The Parcel Monkey marketplace is an ideal service to compare shipping prices so that mailing your record collection can be easily done. Using Parcel Monkey to ship an old record or a new one is no different from sending any other item. Once you have the record packed and ready to ship, it's time to let our shipping calculator do the hard work. Just enter the dimensions and weight of the package, plus the destination information and we will find you a range of affordable courier services to handle your item. All you will need to do is print and attach the shipping labels and any customs documents if necessary. If you are shipping vinyl records to Europe, Australia or elsewhere you will be able to choose from a wide range of the best courier services such as DHL eCommerce or even use our discounted USPS International shipping rates. If the package is more urgent, we have FedEx services available offering delivery in 2-5 days - just look for International Pickup or International Drop Off once you have put your package details into the shipping calculator. If you are sending within the USA our USPS online shipping rates will be lower than you might be able to get booking direct, as we have access to discounted courier rates due to the volume of packages we send. We also offer a variety of FedEx services from the economy Ground Home Delivery to FedEx Overnight. The courier services that will be available for you to book will depend of course, on where you are shipping to and from. How should I package a 12” or 7” vinyl before postage? 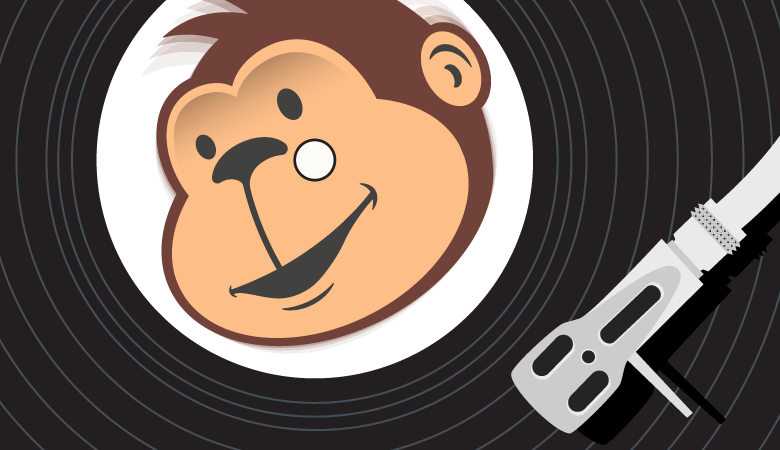 Parcel Monkey is more likely to save you money if you are shipping heavier items such as a record collection or a vinyl storage box with several types of vinyl in. We recommend that each vinyl is packaged individually to minimise the risk of any damage. There is nothing worse than ordering a new vinyl online, or one listed in ‘good condition’ on eBay only for it to arrive with the sleeve corners folded or creased. As a seller, you will of course value customer feedback, so be sure to use a good quality, thick cardboard LP mailer. PRO TIP- Remove the record and inner sleeve from the outer sleeve to prevent movement and any scratches caused by movement in transit. Put the record in its inner sleeve on top of the outer packaging and secure tightly with bubble wrap and tape, so it can no longer move around when being posted. Then using two large pieces of cardboard bigger than the size of your record, put them either side of the vinyl so that it is wrapped safely in the bubble wrap. Secure them all together with some good quality packaging tape. Slot the nicely packed vinyl inside your LP mailer, choose the courier of your choice, print the vinyl shipping labels out, attach to the box and it’s ready to send! When you book a shipping rate with Parcel Monkey, you can also add protection cover to your item in the booking process to give you that peace of mind that the item is covered in the unlikely circumstance it is damaged in transit. Can I ship vinyl records in bulk? One of the most popular items shipped via Parcel Monkey is bulk collections of vinyl records, which have either been sold as a ‘job lot’ or might be shipped by somebody who may be moving to a new location. A bulk load of vinyl could be quite heavy, so expensive to send via the Post Office, so customers using our shipping marketplace can find a better deal using our discounted shipping rates with the likes of DHL or FedEx. Our range of courier services will have you covered if you need domestic overnight shipping, express international delivery or a cheaper standard economy rate. Media mail services are very popular for shipping vinyl records, but you can enjoy full tracking and fast delivery transit times with Parcel Monkey as well, especially for those heavier vinyl shipping boxes or old record collections. If you have multiple vinyls to ship to a number of addresses, then our bulk shipping tools can help you save both time and money. How long will it take to mail LP’s overseas? Many small businesses and individuals who are shipping vinyl records internationally need to know much it will cost to arrange the shipping of their vinyl overseas, as well as how long it will take. We made our shipping calculator quick and easy to use for this exact reason, to help you save time and money. You can send from almost anywhere to any destination using our courier services, but this will, of course, impact on how long it will take for any package to arrive. Our expedited shipping rates will make sure any vinyl you send arrive quickly. Most major destinations can be covered in just a 2-4 day window using our cross-border delivery options. eBay sellers can enjoy not only some of the best delivery prices with trusted and reliable couriers, we also can help them find a way to deliver vinyl records to customers all around the globe. The used vinyl and record market on eBay is huge, as well as marketplaces such as Discogs with popular, rare and limited edition LP’s being sold every minute. Sellers on eBay use our door to door shipping services, protection cover and also full tracking. The tracking details can also be passed on to the recipient, which means you can provide a better level of service to the buyer. Another scenario may be that you are a record collector and buying old records for sale online and the seller isn’t offering delivery to your location. You may be able to advise the seller that you can arrange the shipping from their address, and all the shipper will need to do is box the vinyl up, stick the shipping label on and hand over to the collection driver, or drop off at the local Post Office. What should I list as the vinyl shipping dimensions? The vinyl shipping dimensions you should declare will need to account for the extra weight and dimensions that packaging adds. Any vinyl record that is packaged correctly, will be larger than standard 12” or 7” size. Be sure to measure any item accurately before you get a price for delivery, as you will not want to incur any additional charge from the courier who is handling the goods. Generally, records weigh no more than 200 grams each, but if heavily packaged and in the sleeve or jacket this could increase. Be aware if arranging the bulk shipping of vinyl records, of the weight of all the cardboard sleeves, packaging and even the vinyl storage box you may be using. What about vinyl players and accessories? Record players, record storage boxes, cleaning brushes and spare parts being sold on Etsy or eBay have all been transported using our courier services. Cleaning fluids cannot be shipped however as all liquids are prohibited.